Our Lip Paints are enriched with Castor Oil to ensure your lips are never dry. We also added extra pigments to ensure a little goes a long way! 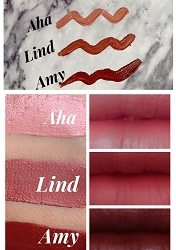 The Lip Paint goes on smooth and creamy, leaving your lips with a rich coat of color. Dab just a little for a lip stain effect or apply full-on for a rich, pigmented look. You can wear it glossy or matte (blot once), the choice is yours! Copyright 2008 Doll Me Up Cosmetics. All Rights Reserved.